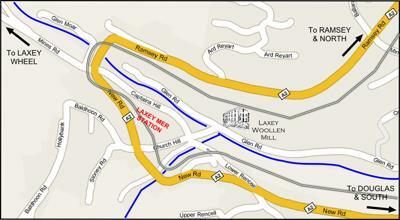 Laxey Woollen Mills is open all year round and is quite easy to find if you are visiting the delightful village of Laxey to take a look at the world famous Laxey Wheel. Simply follow our easy-to-read map below. The Mill is a short walk from the Manx Electric Railway Station and the Bus Service from Douglas to Ramsey. Open Monday to Satuday 10am - 5pm.